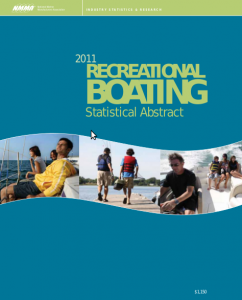 The NMMA produces an annual “Recreational Boating Statistical Abstract” that outlines the US boating market. While the report primarily deals with the smaller vessels that dominate the overall number of units sold in the US, the report reveals broad marine statistics. In reading the 2011 version (available via the image link to your right), I was struck by three statistical trends: (1) an increase in overall boaters, (2) an incredible down market in new sales, and (3) the importance of Florida. The first I noticed was the overall boater rate of person over the age of 18-years-old in the US. Simply put, boating had gone of style in the 2000’s, but the good news is the lifestyle is making a comeback. Participation in 2011 was the highest since 1997’s 35.8% with a three year positive trend of 28.3%, 32.4%, 34.8% respectively for 2009, 2010, and 2011. If this continues we will be back to the 36.5% rate in 1990. The second is the terrible market conditions for new boat sales. While expenditures were down to $32.271 in 2011 billion from a high of $39.493 in 2006, new sales are nearly half in terms of volume and gross at 527,005 units and $6.060 billion compared to 2006’s 912,130 and $11.891 billion numbers. We are still in one of the worst sales markets in many decades. Third, on a positive note, was the continued dominance of Florida in all areas of boating. Florida was the only state with over a billion (1.094 billion) in sales of new boats, trailers, and accessories. In terms of boater registrations, Florida led again with 914,535 stickers while Minnesota was second with 813,976 and Michigan third at 812,066. Florida has a strong argument to being the best place in the US to own a boat with our tremendous diving, fishing, and sailing geography available all year round. With boating seeing return to style and Florida leading the way, I expect when the economy recovers the marine economy will come out even better than ever.